Just as I cannot pass up a good cupcake, the same can be said for jumbo eye and lip pencils. I want each and every one I see. So naturally when NUDESTIX came across my radar, they pulled me in like a tractor beam. And then there is the whole neutral color scheme that only served to make them even more appealing. NUDESTIX kindly sent over some samples for me to try and I have been putting them through the makeup gauntlet. 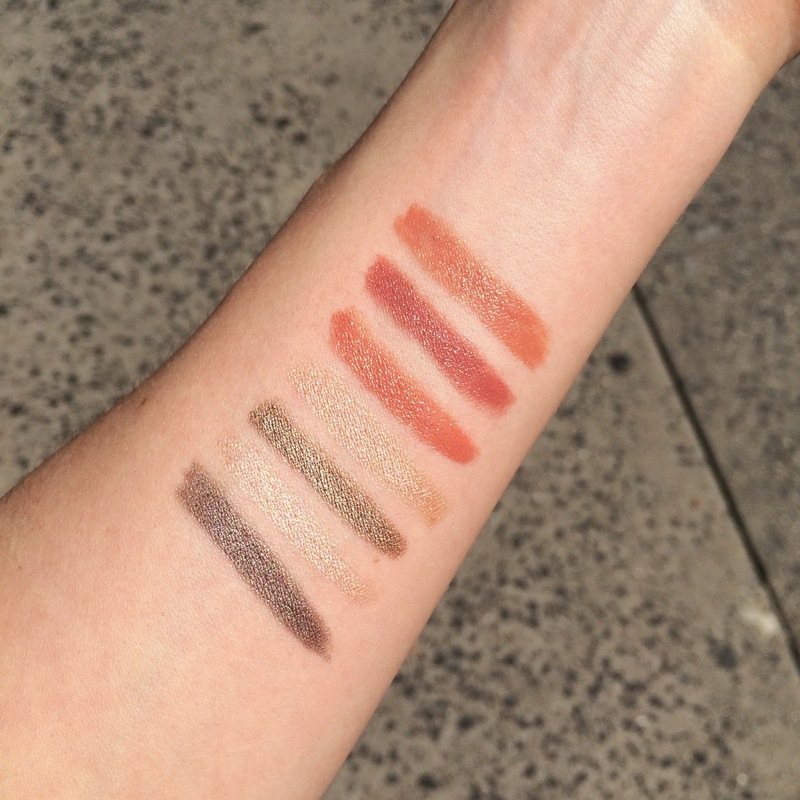 Below is a look at the swatches of all the shades I tested. 1. Eye Pencil - The 2 colors I tried were Smoke and Stardust (bottom two swatches), which are a harder formula and wear more like a traditional eye liner. I initially wore these all over the lid as an eye shadow but found they creased a bit after about 5 hours (even with primer), so I switched to using them just as a traditional eye liner. This proved to be a much better option for me and loved the effect they gave the eye. Smoke looked beautiful smudged around the entire lash line (upper and lower) for a delicate smokey eye, and Stardust is the perfect inner corner highlight. Each comes with a sponge on the opposite end to help blend the liner, though I found that my finger worked equally as well. 2. Magnetic Eye Color Pencil - I have the colors Twilight and Angel (shown above in the middle two swatches), and absolutely LOVE these with every ounce of my being. I simply cannot sing this pencil's praise enough! They are so smooth, creamy and glide on effortlessly. I apply them directly to the lid (over primer) and then blend with either my finger or a synthetic brush. Oh, and then I just sit around and wait for them to crease. Still waiting. Frankly, I may be waiting until I am 80 because I have yet to see these bad boys move. I am actually wearing them now as I write this post and they are still going strong at 7:03 p.m. at night after applying them at 7:45 a.m. this morning. Yup, that's almost 12 long hours my friends. Amazing. Oily lid gals - get in on this immediately. 3. Lip & Cheek Pencil - The 3 colors I tested were Soul, Mystic and Blush (shown in that order top to bottom in the above top 3 swatches). While they are for both lips and cheeks, I used them only on my lips. I wish I could tell you I had a favorite shade, but frankly I loved them all. You are on your own with this one. Of course they all give that "my lip color but better" so I'm not sure you can go wrong with any of them. Moving on to texture....*mumbles with hand over mouth* I like them better than my NARS pencils. What? Who said that? That's madness. (omg, but it's true) They are incredibly creamy without being too soft (you know, the ones that break and smush as you apply - my Bite pencils are guilty of that), and they stay incredibly emollient on the lips. I do have to reapply every 4 hours or so, which doesn't bother me. They do not dry my lips out, they are super wearable, oh and they come with their own sharpener. Yes, you need to try at least one. Maybe two. Don't blame me if you buy three. I had nothing to do with that.